It’s early evening, and once again I am at Lusca, Angus Brown and Nhan Le’s south Buckhead restaurant in the revamped space of what was once the nouveau slick Bluefin. Sipping Prosecco and eating fresh, cold oysters, I watch the place come to life as the setting sun casts a mellow light through the floor-to-ceiling windows. My corner table offers an excellent post for observation—a good thing, because though I was impressed with much of the food on previous visits, I am still struggling to figure out what Lusca is all about. On this night, as on my previous visits, the music is loud and sometimes jarring, probably more suited for the kitchen staff than the diners, most of whom are preppy and middle-aged. 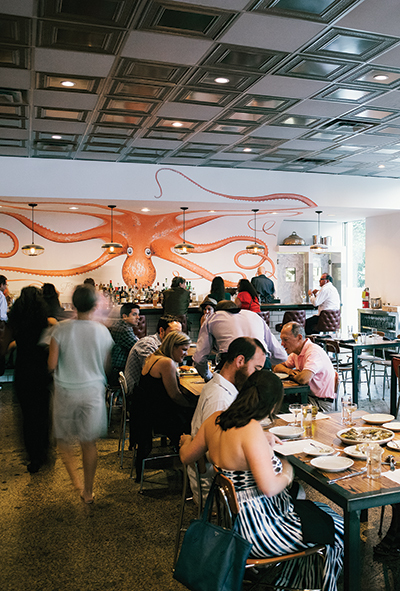 The decor is restrained—crisp white walls, wooden tabletops inside metal frames, subway tile, and a new tin ceiling—with the notable exception of two massive murals of octopi, their tentacles stretching off the wall and onto the ceiling. One hovers above the raw bar; the other guards the liquor. Although the murals stand out, they also make sense. Lusca refers to a giant octopus of Caribbean lore. It’s an apt name, in part because of the many chefs who work collaboratively to create an eclectic and mostly excellent—if inconsistent—menu, making Lusca a restaurant with one body and many arms. But the name, gilded in 23-karat gold across the restaurant’s front door, is also fitting because of Lusca’s heritage. Lusca might have valet parking and an uptown address, but this Buckhead baby was born across town, sprung from the feral Octopus Bar, Brown and Le’s raucous, after-hours, cliquey East Atlanta hot spot. Octopus Bar originated as a popup but is now open six nights a week, sharing space with Le’s Vietnamese restaurant, So Ba. Like a club kid starting his evening fashionably late, Octopus Bar doesn’t open until 10:30 p.m., only after So Ba has closed. It’s a place for restaurant insiders to drink up, chow down, and unwind over a ballsy menu, such as the homemade pasta tossed with pancetta and uni (the gonads of sea urchins). 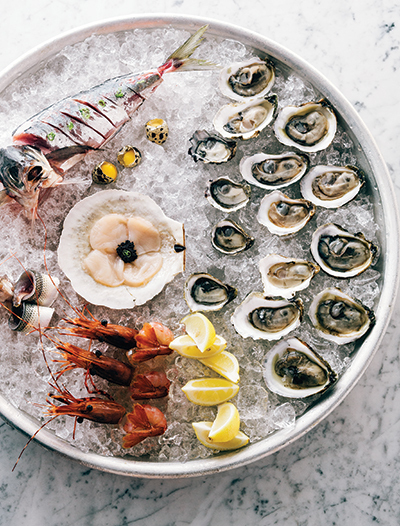 Lusca’s strongest similarity to Octopus Bar is the menu: Both are heavy on seafood and designed to be shared. But Lusca’s offerings are more extensive. 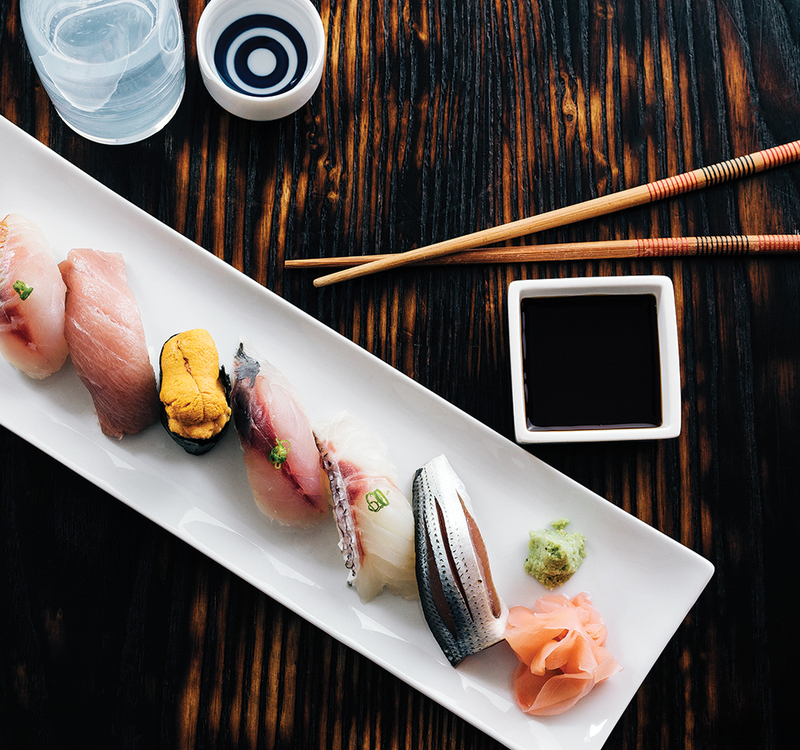 The menu essentially combines three restaurants into one: a sushi joint, a charcuterie, and a formal kitchen. 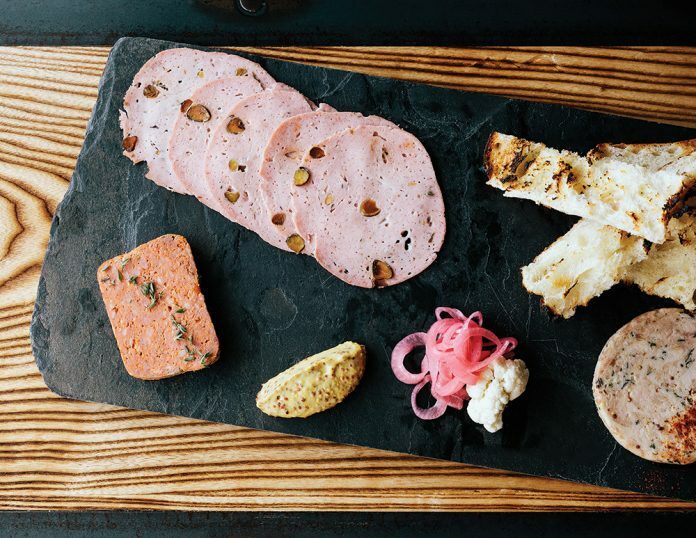 Butcher Jonathan Sellitto’s charcuterie boards are a standout. Succulent rabbit liver mousse melts on pastry chef Brooke Lenderman’s pain au levain. The marbled coppa, rimmed in Espelette pepper, is a wonderful balance of smoke and spice, silk and chew. Le offers a thoughtfully curated sushi menu; I was especially taken with his unctuous, puddingesque steamed monkfish liver. I loved Brown’s simple avocado toast piled high with sweet rock crab, dotted with Key lime mustard, and scattered with scallions. Perfectly seasoned quail—perched on smoky maitake mushrooms, bitter escarole, and plump beans that tasted of bacon—practically fell off the bone with the touch of a fork. Not everything on the menu worked. A pulled-chicken stew with ricotta dumplings was bland, and despite the hype, the uni pasta disappointed; the noodles clumped, so it looked more like the world’s most un-kosher noodle kugel than silky strands of pappardelle. The rabbit agnolotti made up for the uni: three delicate pillows of pasta, stuffed with rabbit mortadella (the dignified Italian ancestor of American baloney), then set afloat in a rabbit broth as clear as it was rich. For dessert, Lenderman’s semifreddo (imagine gelato blended with whipped cream) was garnished with strawberries and served on a puddle of lemon curd with crumbled meringue on the side. Tasting like a cross between a deconstructed French macaron and my beloved grandma’s lemon icebox pie, it’s one of the best desserts I’ve had in memory. It was so charming and thoughtfully prepared that I temporarily forgot I was in a restaurant that prides itself for its edge. That is, until I ordered a cup of coffee and was told by the server that decaf is forbidden. “Our barista is a real coffee snob,” he said. Although Octopus Bar’s origins are rooted in the ethos of the punk rock movement, Lusca has taken root in a stylish and well-appointed space on Peachtree Road. It’s on the edge of Brookwood Hills, a wealthy, established, family-oriented neighborhood of folks who surely enjoy decaf coffee and early bedtimes. And so I keep wondering, as I watch another polished couple enter the restaurant, why Brown and Le chose this location. Brown cites south Buckhead’s central location, which intersects with so many of the neighborhoods that make up this city. But we are not a pedestrian town. We do not bump up against each other the way people do in, say, New York. Most of us navigate traffic in our cars. We don’t intersect but rather travel separately from place to place. It is also hard for me to imagine many East Atlanta folks trekking across town to get here; my guess is they will stick with Octopus Bar. Which means that Lusca is attempting to wrap its tentacles around a new crowd, one that expects valet parking and does not blink at a $160 bill for two. Yet Lusca also wants to hold on to its bad-boy roots. The cynical part of me wonders if Lusca represents the Disneyfication of East Atlanta—the other side of town made palatable for the Buckhead crowd, with their thick wallets and expense accounts. Cynicism aside, there might be something else going on here. Atlanta is infamous for its unchecked commercial development and sprawl, but lately there has been a new push to reclaim abandoned urban space, most notably the Atlanta BeltLine and the massive renovation at Ponce City Market. With all of this repurposing, why not invest in reverse urban pioneering—the opposite of gentrification—especially if Lusca can glide into the carcass of what once was Bluefin and give it a shock of new life? Le and Brown created something edgy and interesting in East Atlanta, catering to a crowd they know. Perhaps Atlanta is ready for a bit of East Atlanta in Buckhead. Still, it might not be a bad thing if a little Buckhead gentility rubs off on the restaurant. For starters, they could offer decaf.